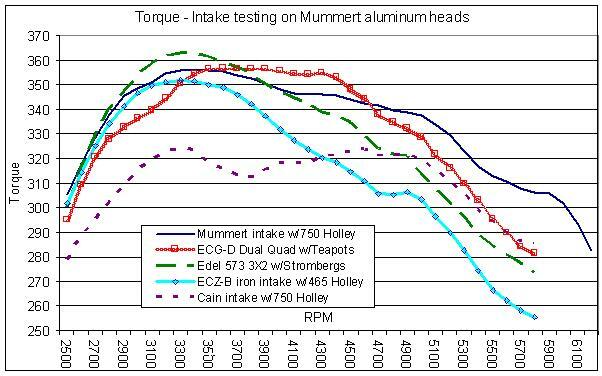 With the aluminum versus iron cylinder head baseline dyno testing completed, there were some other variables that were begging to be evaluated before removing the Mummert aluminum heads from the Ford 312 Y-Block test engine. These included increased ratio rocker arms and a variety of intake manifolds and/or carburetion setups. 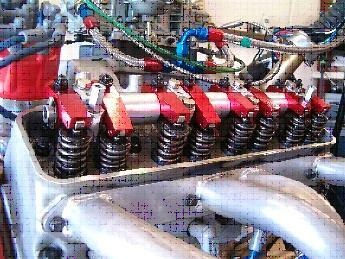 The same +060 over Ford 312 Y-Block engine with the Crower Monarch camshaft that’s been used for dyno testing up to this point is still being used and is holding up great. Issue #99 of the YBM gives the finer details on this engine. using the same 0.019” hot lash settings, the peak numbers jump up to 353.8HP @ 6100 rpms and 355.8 lbft torque at 4400 rpms. Wow! A twelve horspower increase with just a rocker change. The net valve lift with the 1.6 rockers increased to .472” which really makes the effective rocker ratio 1.64:1. This occurred by manipulating the pushrod length which in turn allowed the rocker ratio to be increased beyond its rated 1.6 value. Only the rocker arms were changed in this test as the same 1” tall HVH tapered carb spacer and 750HP vacuum secondary carb were used with both sets of rockers. 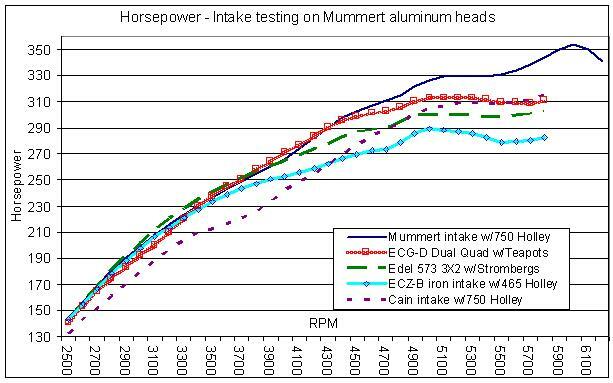 The graph on previous page shows both the torque and horsepower curves as a result of the rocker arm tests. stayed in place for the intake manifold tests. 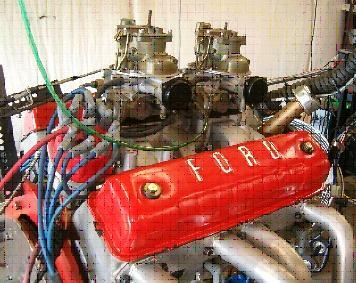 The other intakes being tested included an original 1957 Ford ECG-D aluminum dual quad setup, an Edelbrock 573 three deuce setup, a stock ECZ-B iron 4V intake, and the CAIN 4V open plenum intake. Using the same scoring format that has been used in previous testing, here’s how each manifold scored. Here are some specifics on each of the tested manifolds. The Mummert aluminum 4V intake was topped off with a 1” high HVH tapered carb spacer and Holley HP series 750cfm vacuum secondary carbureter. 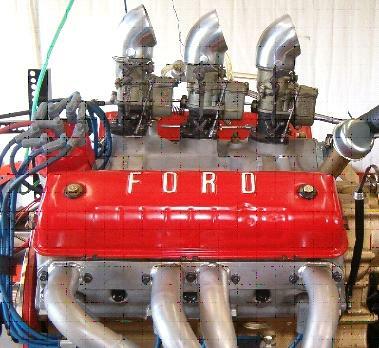 The Ford ECG-D 2X4 intake had a pair of original dual quad Holley model 4000 carbs (aka Teapots) each having list numbers 1434 and were setting upon the factory phenolic ½” high 4 hole spacers. The Edelbrock 573 3X2 intake was topped off with Stromberg 97’s with #48 jets all the way around. 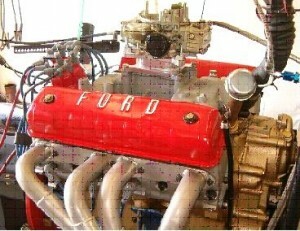 The 3X2 setup was the one setup tested that showed an increase in manifold vacuum in the upper rpm ranges indicating that the engine was actually running out of breath and needing larger carburetors. The stock ECZ-B 4V iron intake was ran with a variety of carbs but the L1848 465cfm Holley was the overall best performer with a 1” high 4 hole spacer under it. The Cain intake used a 2” high 4 hole ‘hi-flow’ spacer with a 750cfm Holley. 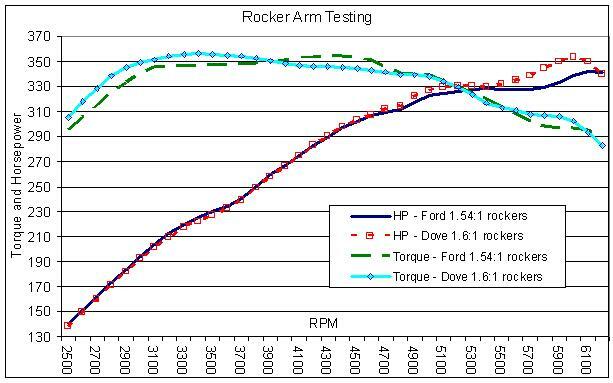 But the whole story is not just in scores or peak numbers so here’s a pair of graphs that gives a much clearer picture of how each manifold performs throughout the testing rpm range. Click on graphs for larger views. As can be seen by examining the graphs, the aluminum heads still shine with some of the older 3X2 and 2X4 intakes being bolted atop them. The Cain intake in being an open plenum manifold and having no internal runners was down on bottom end torque but the horsepower does try to come back around in the upper rpm ranges. I had reported in the last article that the test engine was happy at 32° total timing. It was found at the end of the intake manifold testing that the factory damper was slipping so that number may not be a ‘etched in stone’ value to use. Testing on the 375 inch EMC (Engine Master Challenge) combination is finding that 37-38° total ignition timing is a more ideal value on that particular engine. There will be some additional testing in the near future to reaffirm the timing characteristics for these new heads. That’s it for now and until next time, happy Y motoring. Ted Eaton.